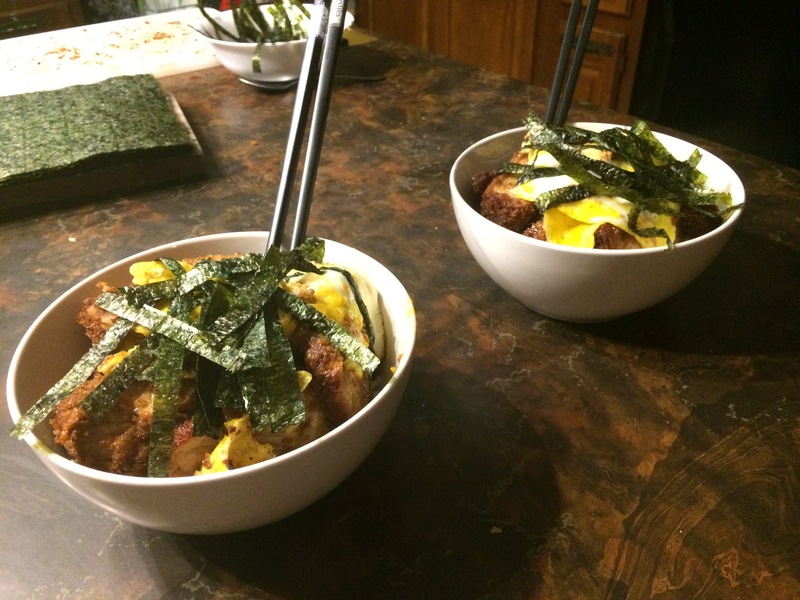 I decided to make カツ丼 (katsudon) for New Year’s this year. It’s definitely the most complicated thing I’ve ever made for New Year’s—our family’s usual dinner is fried chicken and New Year’s pretzel—but I really wanted to make it for everyone and I hadn’t thought of it in time for Chanukah and I was too busy making cookies during Christmas. It was a wild goose chase of strange Asian markets to try and find the ingredients. I found a surprising number of them in my local grocery store—who knew Giant Eagle carried mirin?—but at the end of my day of shopping, during which I had asked かつおぶしはどこですか (katsuoboshi was the thing I was looking for: it’s dried tuna flakes) more times than I can count, I ended up in a strange little Oriental market in a tiny strip mall that shared a parking lot with a Red Lobster. My siblings, who made the mistake of deciding to come along, petered around the market, whispering to each other because speaking English in the market felt a little bit like infringing on the delicate island of Asian culture within the massive sea of English-speaking America. When I muttered to myself, I very deliberately did so in Japanese, for the same reason. It felt like a heinous act of cultural appropriation to so much as exist in that store, and even more so to speak in a non-Asian language. I failed to find what I was looking for, so I bought a poor substitute (dried scallops) and we went home. During the car ride, we talked about the way it felt to be Jews infringing on Asian culture. Then, as we walked into the house, I saw that my sister was carrying a bag with some brightly-colored packages in it. Knowing that she had a hard time even navigating the store since everything was in some combination of Chinese, Japanese, and Korean, I wondered what it was that she had picked up. “What is that?” I asked, gesturing to the packages. “Oh! This is a dessert dumpling thingy that we all had when we went to Hong Kong! Everyone loved it, and I saw it, so I picked up some!” She proceeded to rant enthusiastically about how good the thing was, and as soon as we got home, she took out one of the packages and made it right there and then. She was right. It was awesome. After we ate our dessert dumpling thingies, which turned out to be called milk yolk buns, I started cooking my カツ丼. The first thing I did was boil the dried scallops to make a poor substitute for だし (tuna broth). Then, I went about making とんかつ. I heated the oil and set up everything I needed to bread the pork tenderloins, then breaded them as I watched the oil heat up in the pot. When the oil was hot enough that a panko crumb dropped into it would float right to the top, I started frying the breaded pork. At some point, my sister put on some 80s rock. As we all cooked and ate and hung around, I remembered something. One of our first missteps on our wild goose chase for katsuoboshi was an Indian market. While searching up and down the aisles, one of my sisters asked for help from an older Indian man. He said that he’d never heard of what we were looking for, since the store didn’t even carry Japanese foods, but he was very happy that we were here, and he recommended trying some Indian food if we’d never had some. He even gave us a specific restaurant at which we should do so. And that got me thinking. If I was walking around a Jewish market—I’ve never been to one, since Giant Eagle has a good Kosher section, but if I had—and somebody came around and clearly had no clue what they were doing, I would have been happy to help them out. Obviously, if they’re here, they have some interest in Jewish food: how awesome is that?! Somebody who isn’t a part of my culture wants to learn about it! I couldn’t imagine myself thinking of it as anything other than flattering. On a regular basis, my family has goyish visitors over for the High Holidays. We love sharing our culture with people who aren’t a part of it. And as I thought about it, so did that Indian man who saw clearly non-Indian people trolling through an Indian market looking confused. So did the person who hosted my siblings when they stayed in Hong Kong, who taught them about the milk yolk buns. And so would I, if I had been in either of those positions. As a member of a minority culture myself, I’ve never understood why “cultural appropriation” is a separate concept from “ridicule” and “theft”. The times when it makes sense for people to shout “cultural appropriation” seem to fall into those two categories: either someone is imitating a kind of cultural stereotype that ridicules the culture in question, or else a corporation is stealing art made by a culture without paying the people who actually came up with the art in the first place. If cultural appropriation is just ridicule and theft as they relate to culture, then obviously it’s bad, but ridicule and theft are already bad. Why have a separate word? And further, I’ve heard some people calling “cultural appropriation” when someone does something like show genuine interest in a culture, or want to combine parts of that culture with parts of their own. And, speaking again as a member of a minority culture… I appreciate the effort, but I think people are trying to protect me from something I really don’t need to be protected from. When some other culture steals American majority culture, nobody complains. In Japan, people celebrate Christmas, but they do it in some notably Japanese ways. Notably, there is no “Christ” in Japanese Christmas: a very small fraction of Japanese people are Christian. Further, they have a specific Christmas cake; Christmas is time for couples, not families; and on Christmas Day, they eat KFC. Basically, Japanese people stole American Christmas and made it theirs. They committed the sin of cultural appropriation. Right? Not really. Here’s the key difference, and it doesn’t have to do with minority vs majority cultures. The things that we call “cultural appropriation” that are genuinely despicable happen when someone steals a culture or cultural tradition and pretends that it’s theirs, that they own it. The sorts of things people call “cultural appropriation” that are actually fine happen when someone uses aspects of a culture or cultural tradition, but respects the origins of the culture and defers to the people who actually have that cultural background. They borrow, they don’t steal. You don’t need a “get out of cultural appropriation free” card from a Real Member Of That Culture™ in order to be able to borrow culture. You can borrow whatever culture you want, so long as you do it respectfully. Understand that the Real Members Of The Culture are the keepers of their culture, if not the proprietary practitioners of it. And ask them questions, not permission. Here’s a passage from the Passover Haggadah. “All who are hungry, come and eat; all who are needy, come and make Passover.” Basically, if you want to come in and celebrate our holiday with us, we’d be happy to grab you a yarmulke and a place setting. I think if everyone had that kind of attitude towards culture, the would could be a better, more unified place. “I love kanji.” It may seem strange to hear from a foreigner. Aren’t kanji what make learning Japanese impossibly hard? Wouldn’t it be easier for me to learn Japanese if they stopped using kanji? Quick background for those who don’t know: Japanese has three writing systems: hiragana, katakana, and kanji. Hiragana and katakana are both alphabets, with ~50 letters each. Kanji are Chinese characters, and there are 2200 of them in common use. Not only that, each kanji has multiple different ways it can be pronounced. This is understandably a point of annoyance with foreigners trying to learn Japanese, and even among native Japanese speakers. “I love kanji.” It may seem strange to hear that from a 外人 (がいじん, foreigner). Aren’t kanji what make learning Japanese impossibly hard? Wouldn’t it be easier for me to learn Japanese if they stopped using kanji? I can ask similar questions about 敬語 (けいご, honorific speech), 高低アクセント (こうていあくせんと, pitch accent), or any other thing that notably distinguishes Japanese from English. But first I’d like to know, who is the person who picks up Japanese—a language so obviously distinct from English that before you can even start speaking, the writing system is intimidating—and then proceeds to complain about the ways that it’s different from English? If you want to learn a language that’s easy for an English-speaker, learn German! Here’s my main reason. I’m learning Japanese because I adore the culture. Maybe it was the fact that my dad rewarded my siblings and I for doing chores with episodes of Wolf’s Rain and Tenchi Muyo, but I’ve always liked Japan. And language reflects culture. Japanese people use kanji because they stole them from China, then altered them to fit their purposes. We English-speakers did the same thing when we stole the Roman alphabet from, uhh, the Romans. And along the same vein, Japanese people use 敬語 because they’re a very polite people, with a highly stratified society built on respect. In short, I love 日本語 because I love 日本. That’s one reason. But I’ll go a step further than “I love kanji because it’s culturally important”. I’ll say I love kanji because it’s linguistically important, too. However, there’s a different kind of writing system: a “logographic” one. Logographic writing systems include hieroglyphs, Chinese characters, and kanji. They don’t represent noises, they represent meaning. If I say a little box like this 口 means mouth, because it kind of looks like one, then I can say that this 言 means speak, because the lines are words coming from the mouth. Congratulations, you now understand how kanji (and Chinese characters, they’re the same thing) are put together. The benefit of phonographic systems is that it’s really easy to pronounce words once they’re written down. The drawback is that unless you happen to know what the sequence of noises means, being able to say the noises out loud doesn’t do you any good. On the other hand, as an avid student of kanji who occasionally forgets the readings, I frequently end up on the other side of that coin: “I know this word means outside, but I have absolutely no idea how to pronounce it.”* In other words, logographic systems do a great job at telling you the meaning, but they tell you diddly for pronunciation. Japanese already does exactly that. The central meaning of a word is conveyed with kanji, whereas verb and adjective endings are written in hiragana. To make our lives (as 外人) even easier, there’s a third writing system for words that Japanese stole from other languages (90% of which are stolen from English). If you write ぱーちぃ like that, I’ve got no idea what word that is. I don’t recognize it. But if you write it like this パーティ, it’s like the text is screaming “turn your English-speaking brain back on!” at me, and so I do, and I sound out the katakana and figure out that パーティ means “party”. So you see, instead of thinking “oh god, there’s three different writing systems, that’s so complicated, I’m going to die, I can’t learn this”, you should think about the reason why there are three writing systems. Humans are lazy. We don’t make our lives complicated for no reason. If something seems needlessly complicated to you, maybe you’re just thinking about it the wrong way. And that is why I love kanji. *In case you were curious, the kanji for “outside” is 外 and, by itself, it’s pronounced そと. You might also notice that this kanji is present elsewhere in this essay: a 外人, foreigner, is an “outside person”. Literally, that’s what the kanji mean. My native language is English, like most people who live in America. However, unlike most people who live in America—and probably unlike most people who live in any country—I had an interesting choice in second language: Latin. I spent around ten years studying Latin, starting with Rosetta Stone Latin (yes, that exists), and culminating in the AP test: a high-stakes exam taken in American high school that’s equivalent to a college course. If you asked me to write an essay in Latin, even now—when I haven’t touched a single Latin word for nine months—I could probably do it. Well… if you let me use a dictionary to supplement the vocabulary I’ve forgotten, I could. To be fair, dead languages are exactly like living ones in most major areas. They’ve got grammar and writing systems and vocabulary. Even pronunciation! Some scholars, who obviously have nothing better to do with their time, have reverse-engineered Latin pronunciation from root words and poetry. There is only one thing dead languages don’t have. Conversation. In all my time studying and speaking Latin, I never had a single conversation in it. I translated Vergil’s Aeneid and Caesar’s Gallic Wars, and yet I don’t even know how a Roman would say “um”. They never wrote it down! This gives me a very strange handicap when I try to learn a third language, because my third language, like my first, is living. I know how to say “um” in Japanese, because there are real Japanese people I can talk to who say “um”. (Well, えと.) And in my third language, I can have conversations. The problem with conversations is that they happen fast. When you write, there’s a moment where you can stop to consider what word you want to use. When you write, you can go back to edit what you’ve already put to paper. But when you talk, there’s none of that. You have no time to think, and it’s all permanent. My brain, which is used to having time to think, does not like this. At this point, my language-processor storms off in a huff and refuses to speak to me anymore. I write this dialogue because there seem to be two types of language learners: absolute beginners, who have no idea what fluency in a language looks like, and seasoned language veterans, who know what fluency looks like and just have to figure out how to get there with this new language. I’m in a strange middle-ground. I can tell you exactly where I stand on the fluency scale as it relates to reading comprehension, translation, or listening. But if you ask me about conversation, I have no idea where I stand (though I assume it’s towards the very bottom). Further, I have no idea how to improve. From here on out, I’ll be cataloguing my journey of trying to figure out how to do the fluent-in-a-living-language thing. All such posts will go in the category “japanese”. I tried to not write this for some time, but unfortunately, I have too many thoughts and my hands can’t stay off the keys. I believe my thoughts are restless ghosts who wrongfully inhabit my brain and desperately wish to be somewhere, anywhere, else. So, I’m giving them a home on this electronic page. I can only hope that these restless spirits may become useful to someone.